The CD version of the Insolito Records 10". This has a different mix of the four 10" songs plus extra material exclusive to the CD including two bonus ambient/noise tracks and a Husker Du cover. The CD version also has an alternate layout/design by Ryan Patterson (Black Cross, Initial Records). 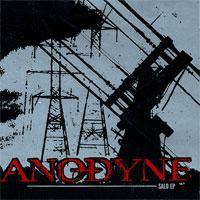 Maybe like a year and a half ago, I asked Mike from Anodyne if they would like to do a 7" on Init. I had set up a show for them in Mankato, MN and met them that way, and loved their band when I saw them play. Mike said they were always interested in 7" projects, and to keep in touch. Then, when the band was doing a week or so of dates with Caligari on the west coast, I suggested to both bands about doing an Anodyne/Caligari split 7". Both bands were into it, but then Caligari unexpectedly called it quits. I still anted to put out an Anodyne release and Mike suggested doing the CD version of a 10" they were doing on the German label, Insolito. Almost a year later, things finally materialized and this was sent to the plant... the result is a massive wall of sound and aggression in the best way possible, of course.